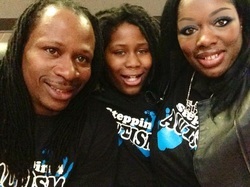 Steppin 4 Autism was started and founded as a result of our personal trials, tribulations and triumphs with our son, Deontay Farr. Our struggle began when Deontay Farr was diagnosed with Autism in 2009. Before that I never even heard of Autism. When I first told my mom about it she said don't let them doctors tell you something’s wrong with your baby. It was very hard to accept and deal with in the beginning and sometimes even now in our journey. There were no support groups or much help in our community. Most Autism diagnosis takes place within the first three years of life when a child is developing. Deontay was diagnosed at the age of seven when he was kicked out of first grade. A staff member at his school was aware of certain signs he displayed that reminded her of her own son who had a similar disease called Asperger's. After further discussion with us, she recommended that we have him tested and she shared additional information that could possibly assist us. Unfortunately, because he was past the normal age of diagnosis, we were unable to receive immediate help. Often times we were given the run around or put on various waiting lists. We googled everything and started implementing our own ideas to make it work and to have references for other parents that may go through the changes we did. I am so happy and blessed that it was three of us in this struggle my husband, I and God or we would’ve never made it. What hurt me the most was thinking back when Deontay use to scream when the sun came out, as if it would hurt for the light to be on him, or when we would spend money year after year on birthday parties, I would get frustrated when he would sit in the corner and not smile nor be happy. Little did I know he either couldn’t, didn’t understand or wanted to be around all those people. We didn’t understand why he didn’t want his food to touch, socks to be on his feet no matter what the temperature was. While most kids were riding their bikes at the age of 9, he was not and still can’t ride one. He also does not like to go outside nor leave the house under any circumstances. With Deontay being our youngest child, we wanted to hug and kiss him; however we found out that he does not like to be touched. Imagine how hard it is to have a baby boy that doesn’t like to be hugged or share the same excitement as other kids his age. Going to the grocery store is also a traumatic experience for him. He will walk in and scream, so we had to adjust to that as well. Our family and friends love him dearly, but they really don't understand what it’s like raising a child with Autism. Deontay has a hard time adjusting to change; it takes a toll on him. When school starts, most kids like to wear new clothes, however Deontay doesn’t like wearing anything new. His father tries to do normal father and son activities, but it’s hard because his motor skills are different. On top of it all last year he was diagnosed with Crohn’s disease ( Crohn’s disease is an inflammatory bowel disease (IBD), the general name for diseases that cause inflammation and irritation in the intestines) so he visits the hospital every four weeks for treatment among other things that goes wrong with this illness. It is very, very difficult having a child with Autism, the normal behavior that a parent shares with their child of love is often rejected. It affects our whole family. Deontay is not completely satisfied unless both parents are at home with him, so we make every effort to spend as much time as we can with him together. God made us to be the best parents for Deontay. This job is never ending and it takes a special gift to be able to cope with an Autistic child. As much work as it is, the reward is beyond profound.